The prosthesis of the ankle is a therapy for patients with advanced ankle osteoarthritis. Usually an accident (trauma) is the cause of osteoarthritis of the ankle. Very often, trauma can cause ankle osteoarthritis within years or even decades after the accident. The osteoarthritis affects the ankle joint, which is formed by the anklebone (talus) in the foot, and shin bone (tibia) and fibula in the leg. The ankle essentially supports the vertical movement of the foot relative to the lower leg: this mobility is important when supporting a normal gait pattern when walking. Who can benefit from a total ankle replacement (ankle prosthesis)? Patients with osteoarthritis of the ankle receive the greatest benefits from the ankle prosthesis procedure. What can I realistically expect from an ankle prosthesis? Improvement of pain in the ankle joint: severe ankle pain is an essential precondition for an ankle prosthesis operation. Preservation or normalization of gait after joint replacement. Mobility in the ankle is not fully restored in comparison to a fully functioning, biological ankle joint. It will, however, be sufficient for a normal pattern of walking. 10° of mobility in dorsiflexion and 20° mobility in the direction of plantar flexion are sufficient to meet the requirements for all everyday tasks of the artificial ankle. 90% of patients are satisfied after ankle replacement. Patients who are about to receive an ankle prosthesis are suffering chronic pain and have experienced loss of motion. In order to qualify for the procedure, conservative attempts to treat ankle osteoarthritis must have been exhausted: insoles and physiotherapy. Concentric osteoarthritis: the anklebone (talus) is centered in the joint. Eccentric osteoarthritis: the talus is tilted. The type of ankle osteoarthritis is essential for the prosthetic fitting. This needs to be clarified through a good clinical investigation by the ankle specialist. Common arthritis, ankle arthritis caused by accident or rheumatoid disease can all be treated with an ankle prosthesis. 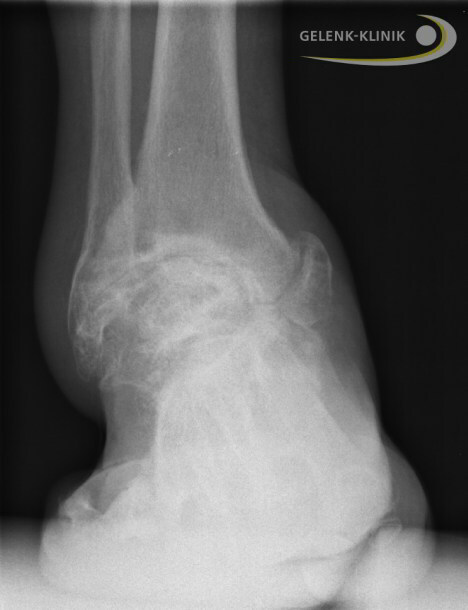 A large osteonecrosis of the talus is generally a contra-indication for an ankle prosthesis. Only small areas of osteonecrosis can be treated with an ankle prosthesis. It must be made absolutely clear, that a prosthesis of the ankle can only be accurately assessed within the global situation of the lower leg, ligaments, position of the heel bone and the longitudinal arch of the foot. An isolated view of the ankle alone is not effective in most cases to make a proper assessment of a long-term and stable therapy of osteoarthritis of the ankle. Once we are able to fully assess the individual situation pertaining to a particular foot and ankle, the ankle prosthesis is a safe and comfortable therapy for the treatment of osteoarthritis of the ankle. In assessing the ankle prosthesis, general concepts of foot and ankle surgery must be integrated. While not everything that we describe is applicable to every patient, the following provides a concise explanation of the most relevant circumstances of the complex therapy of ankle arthritis. Also very common is the development of ankle arthritis associated with congenital disorders of the leg axis (skew feet), accidents (ligament rupture) and disease or accident related malpositions of the ankle. Which surgical interventions can treat ankle osteoarthritis? 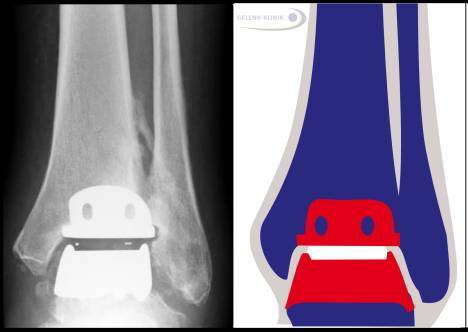 Ankle prosthesis: The prosthesis made ​​of titanium with movable PE (plastic) core can support the mobility of the ankle, even if the articular cartilage is already worn out. Ankle arthrodesis: The therapeutic fusion of the bones in the ankle joint allows pain-free weight bearing. Joint preserving osteotomy alleviating atypical patterns of weight bearing: By moving the intact cartilage surfaces of talus in towards the weight bearing area through osteosynthesis, the function of the ankle can be maintained. Even if the restoration of the normal axis in the leg is no longer helpful to preserve a worn out ankle joint, it is still a precondition for a stable ankle prosthesis. Sports with ankle prosthesis - is that possible? The patients lifestyle has a considerable influence on the durability of an ankle prosthesis. In principle, all types of sports are possible with an ankle prosthesis. The likelihood that a patient can continue with his/her sport of choice varies depending on the type of sport in question. Golf, cycling, swimming and cross country skiing are the easiest to maintain. The return to sports with strong shock and shear forces such as downhill skiing, soccer and tennis is significantly less likely to succeed. The prognosis in a particular case depends to a high degree on the individual and varies on a case by case basis. After a correct surgical procedure a good rehabilitation treatment is the most important factor. Generally, patients are much more likely to resume sports - whatever the sport is - after prosthetic surgery of the ankle than if they had not had this surgery. What activities are no longer possible with ankle prosthesis? Most everyday activities are usually no problem after total ankle arthroplasty. Only heavy lifting of more than 20 kg on a regular basis is not compatible with the longevity of an ankle prosthesis. 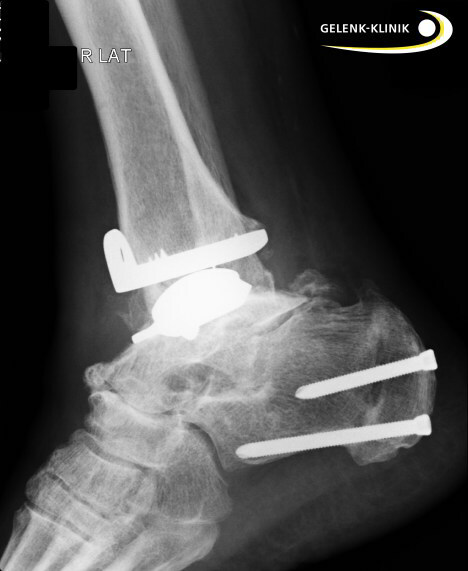 Professionals such as construction workers can therefore still experience better results with an ankle fusion as opposed to an ankle prosthesis. 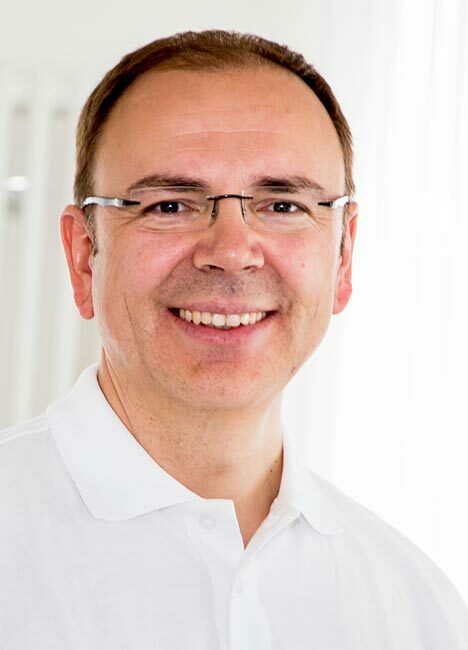 In severe cases of advanced osteoarthritis many orthopaedic specialists still consider the ankle fusion surgery (arthrodesis) to be the standard - and superior - treatment. The fusion surgery always causes a significant reduction of mobility in the ankle joint. The natural gait pattern can no longer be preserved as a result of the ankle fusion surgery. This disturbance in gait is one of the main disadvantages of ankle fusion surgery (arthrodesis). The fusion surgery is very often applied as the gold standard (first recommended therapy) in the treatment of advanced ankle arthritis. The altered pattern of movement causes an overload in the adjacent joints of the ankle, particularly the subtalar joints in the foot as well as the knee and hip joint. 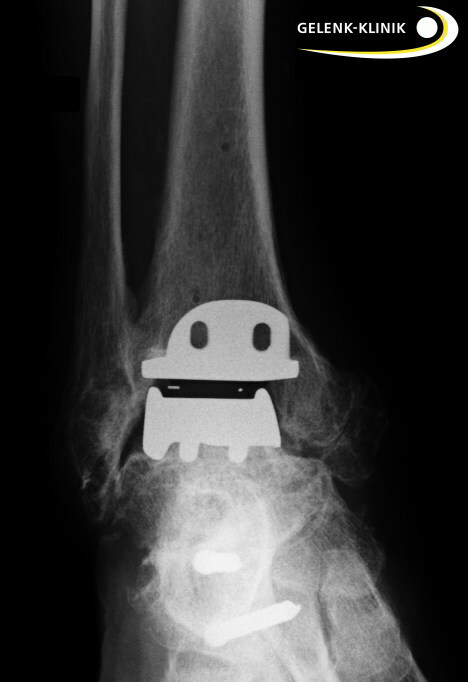 Therefore, according to our experience we recommend exploring the individual possibilities of a gait preserving prosthesis before considering the fusion surgery in every particular case of severe ankle osteoarthritis. A fusion of the ankle joint - via the reduced mobility - can cause secondary osteoarthritis in other joints of the body. The reason for this secondary wear of joints is the unphysiological patterns of mobility resulting from the fusion in the ankle joint, which lead to mechanical overload. The closer the adjacent joints are to the ankle, the greater the impact of the arthrodesis procedure. Therefore, the small joints in the foot are especially affected. "After care" is required until a full fusion is achieved - up to 4 months. Possible complication of fusion reaction can lead to a pseudarthrosis. Secondary osteoarthritis in the adjacent joints are quite frequent as a result of fusion surgery. The fusion surgery of the upper ankle was and is still the so-called gold standard for many orthopaedic surgeons. However, literature and data have shown a few common problems as a result of ankle arthrodesis. Despite these significant disadvantages, the ankle fusion surgery has generally remained the method of choice for ankle osteoarthritis. While prosthesis of the knee or hip have been common procedures for more than 40 years, the results of an ankle prosthesis have not been of comparable quality until about 15 years ago. Prostheses could not displace the fusion surgery among the treatment options for ankle osteoarthritis. In fact, there are still some contra-indications to total ankle replacement. If these contra-indications are present, fusion surgery is a reasonable way to restore pain-free mobility in everyday life. From our clinical experience, nowadays the medical conditions under which a prosthesis remain stable have been largely resolved. However this is not yet a binding and general consensus among all orthopaedic surgeons. In many cases, arthrodesis (fusion surgery) is recommended even in cases where, based on our clinical experience, a joint-preserving approach would have been possible. Before agreeing on any kind of ankle surgery it is beneficial to acquire a qualified 2nd opinion from an experienced ankle specialist. In which cases is arthrodesis still important in treating ankle osteoarthritis? We prefer the arthroscopic approach to fusion surgery. The resulting very low degree of soft tissue damage and scar formation during a minimally invasive approach to fusion surgery facilitates a later revision of a fusion surgery to an ankle prosthesis. The cartilage removal in the ankle joint takes place arthroscopically. The introduction of screws is performed through the skin (percutaneously). Damage to the soft tissue is one of the major obstacles for later mobility disorders of the prosthesis around the joint. Therefore with use of arthroscopic arthrodesis we keep a viable path open for a later revision of fusion to prosthetic surgery for our patients. We see the arthrodesis of the ankle as an acceptable solution especially for young patients: due to the generally high level of activity and more demands on a prosthesis for younger patients a stable ankle prosthesis over decades is not to be expected. With a fusion surgery you can win time. Later in life it is possible to revise the fusion surgery to a mobile prosthesis. 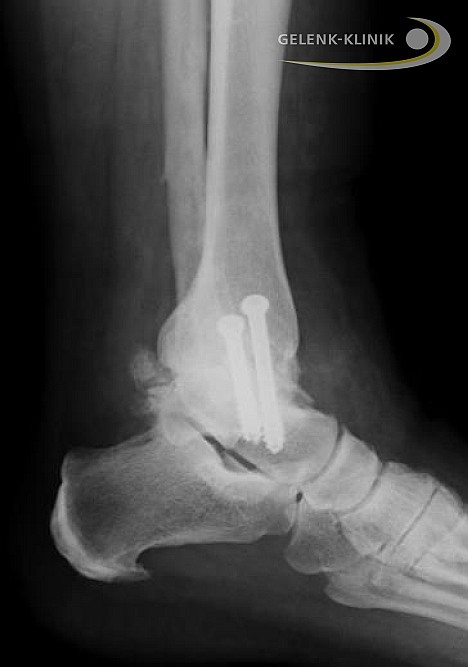 The revision of arthrodesis of the ankle prosthesis is especially helpful when increasing pains resulting from possible concomitant osteoarthritis in the foot outweigh the benefits of the arthrodesis. When this occurs, we are able to respond by performing a revision surgery to an ankle prosthesis. In such cases, fusion surgery provides the opportunity of a stable, pain-free ankle with a high work load. Thanks to the enormous progress in prosthetic design and methodology of the operation, the general situation regarding ankle prosthesis has changed in the past ten years, much benefitting patients. We now know under which circumstances the ankle replacement can guarantee the durability of a prothesis and good quality of life. Through joint-stabilizing secondary surgical interventions, adverse circumstances to ankle arthroplasty can be increasingly controlled. Osteotomy - correction of the position of bones - on the lower leg, the heel bone and mid-foot. Plastic surgery on the inner or outer ligaments of the ankle. For a high durability of the ankle prosthesis it is important to avoid misalignments and assure proper function of the ligaments. The main objective is to achieve a proper vertical load-bearing of the implants while standing and walking. Only then is the high weight load on the ankle prosthesis properly distributed. With the help of the accompanying interventions, a high durability ankle replacement can be achieved, even if misalignment of the ankle was the cause of the osteoarthritis. In order to detect all possible misalignments, a series of x-rays is usually made with the patient standing upright. Through careful analysis the strength and mobility of the ankle can be assessed by the medical specialist. Secondary interventions such as osteotomies and ligament reconstructions should be performed a few months prior to the prosthetic ankle surgery. We have had the astonishing clinical experience that for many cases, properly performed secondary surgery yields a satisfying clinical result and the need for prosthetic surgery can be postponed for many months or even years, because the ankle is again viable in everyday situations. In these cases secondary interventions become ankle joint preserving surgeries. The ankle prosthesis requires well functioning outer and inner ligaments for proper coordination and alignment. The modern 3-component ankle prosthesis does not have fixed components: only the mobile polyethylene (PET) core links the titanium components of the ankle prosthesis. As with the natural ankle joint, the artificial joint depends on the proper function of the ligaments. Hypermobility caused by unstable ligaments needs to be addressed before or during the installation of a total ankle replacement. If, however, instability can not be corrected, this represents a contra indication to the use of the ankle prosthesis. O-position of the hindfoot (varus osteoarthritis). Skew-Foot and deformation of the longitudinal arches of the foot. Rotational malalignment of the ankle joint. Trauma related malalignments of the ankle joint must be corrected prior to considering an ankle prosthesis. If the loadbearing in the artificial ankle joint is not evenly distributed, the result would not be satisfyingly durable and the patient's quality of life after receiving the prosthetic ankle would not be acceptable in the long-term. A stronger ankle malalignment means that a shorter life span of the prosthetic implant should be expected. 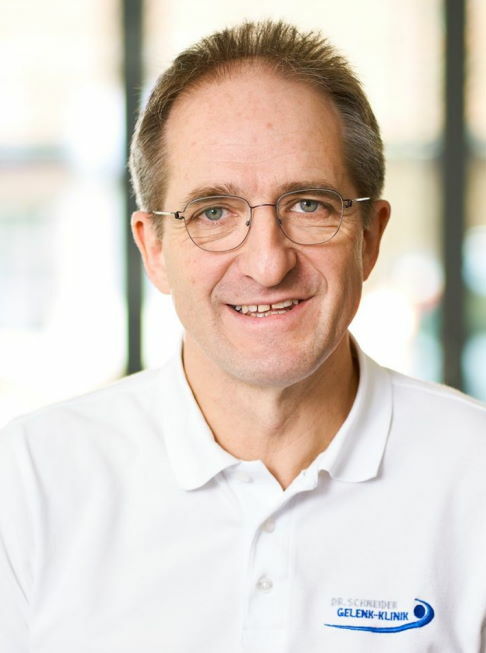 An ankle specialist therefore will address malalignments of the heelbone, the talus and the longitudinal arches of the foot in the context of planning a prosthetic ankle. In some cases a surgical correction is required. In order to achieve optimal circumstances for a durable ankle prosthesis, in some cases significant surgical correction of the leg axis is required. Should the correction of the axis of the lower leg no longer be possible, we recommend ankle fusion surgery as the only remaining therapeutic solution. Medium level of activity: not too high demands on the mobility of the ankle replacement. Good bone structure and bone density in the ankle joint: absence of osteonecrosis and osteoporosis. Good vascular status of the leg: this means that the blood supply should be very good, so that no problems associated with the process of post surgical wound healing would be expected. Well-preserved residual mobility of the ankle joint. Intact coordination of the ankle via stable ligaments. No neurological deficits in coordination and muscular strength. High body weight in combination with osteoarthritis of the ankle. High degree of physical activity, heavy physical labour. Bacterial infections of the ankle joint in the past. Diabetes mellitus - this can affect the wound healing after surgery of the ankle joint. High nicotine consumption (cigarette smoking). 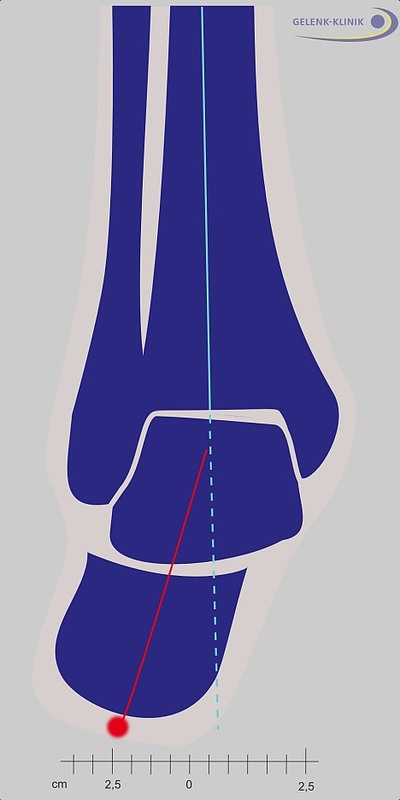 Malalignment of the lower leg axis. A 3rd generation ankle prosthesis only requires a minimal bone resection. The bone will grow organically onto the surface of the prosthesis in order to provide a stable connection. Extensive resection of bone material on the side of the tibia (shin bone) and talus would considerably reduce the load bearing capacity of the bone. The bone just beneath the cartilage layer (subchondral bone) has its maximum weight bearing capacity. Closer to the inside of the bone, the material becomes softer, which reduces the weight bearing capacity of the articular surfaces. The subchondral bone is expected to grow into the surfaces of the ankle prosthesis. In order to provide a stable ankle prosthesis this so called "cortex" region of the bone has to be preserved for maximum stability. For each prosthesis - including ankle replacement - good bone quality is beneficial and yields the best outcome of the prosthetic surgery. Bone density in general is a good measure for the weight bearing capacity of the bone. 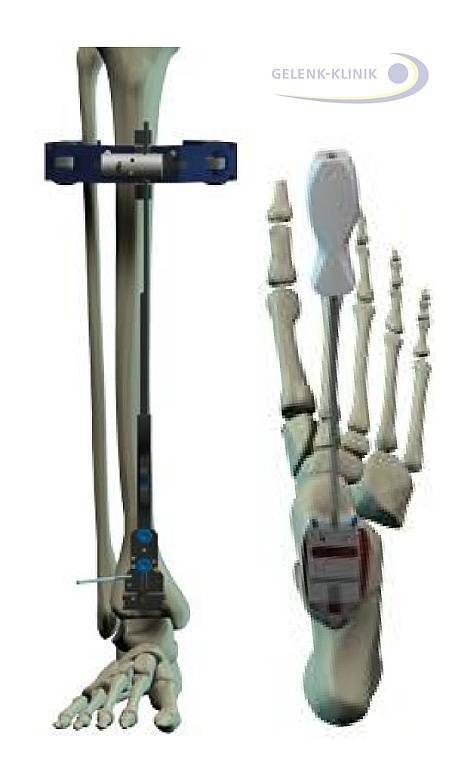 Measurement of bone density helps us to estimate the prognosis of the bone integration of the ankle prosthesis after surgery: the more vital the bone, the more stable the so called osteo-integration of the prosthesis into the bone. If the bone density is insufficient, early loosening of the ankle prosthesis might occur. Particularly, defects of the tibia - the inner part of the ankle joint - are important. Problems in the bone structure may require adequate treatment by concomitant interventions. In particular, the loss of tibial bone by the implantation of the ankle prosthesis should be minimized by careful planning of the operation. In some cases, a CT-scan (representation of the 3-dimensional structure of the bone with X-ray) can help to determine the form and possible deformities of the bones involved. High body weight is generally a disadvantage for the longevity of the ankle prosthesis. Patients with prior trauma and resulting extensive soft tissue damage need to be carefully considered. If we find extensive soft tissue damage as a result of a severe accident, the mobility of an ankle prosthesis might be severely limited by scar formation in the soft tissue, even if the implantation of the ankle prosthesis looks normal in the X-rays. In these cases a proper clinical investigation has to ascertain whether an ankle prosthesis would have the desired outcome in preserving the natural gait of the patient in comparison to an ankle fusion surgery. Secondary osteoarthritis is osteoarthritis in adjacent joints of the ankle. In rare cases only one single joint is affected. Occurrences of secondary osteoarthritis can be quite problematic when assessing the therapeutic options available for treating osteoarthtitis of the ankle. An arthrodesis of the ankle puts an additional strain on the lower (subtalar) ankle joint. The joints in the foot compensate for this additional load, but only to a limited degree. An ankle prosthesis, as a gait preserving treatment, can reduce this pressure on the adjacent joints. In some cases an ankle prosthesis may be combined with an arthrodesis of the subtalar ankle joint. This depends on how much the lower - subtalar - ankle joint is already affected by secondary osteoarthritis. Ankle endoprosthesis of the 3rd generation are always fixed as ingrowing prosthesis. Within 6 weeks after the surgery the patients bone is growing into the rough surface of the prosthesis in order to form a stable compound. The design of the modern ankle endoprosthesis has been constantly improved, especially in regards to the stability and mobility of the ankle prosthesis. Since 1969, trials with ankle prosthesis have been performed. Many technical and medical problems have stopped ankle prosthesis from becoming what hip prosthesis and knee prosthesis are in the field of hip and knee arthrosis: a reliable and stable joint replacement with a long term perspective. In particular, experiments with cemented prosthesis of the ankle have been unsuccessful. In the last 15-20 years, the modern ankle prosthesis has changed this situation. Today ankle prosthesis are no longer fixed with bone cement: they are ingrowing prosthesis. The patients bone tissue will grow within 6 weeks after the implantation into the rough and bone friendly titanium surface of the endoprosthesis. These modern, ingrowing endoprosthesis can be fixated with only a minimal loss of natural bone tissue. Previous generations of the ankle prosthesis had a different construction: they were implanted into the human body with the help of bone cement (Polymethylacrylate). As a consequence of the small surface and the high workload the bone cement often deteriorated quickly, resulting in early loosening of the prosthesis. Modern ingrowing prosthesis form a solid compound with the bone tissue: loosening is now a rare event. The modern 3-component prosthesis also follow the natural biomechanics of the ankle: they are mobile and flexible in all directions. 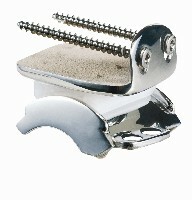 In modern ankle prosthesis the talus is covered with a titanium metal surface. The tibial component is also covered with a titanium component. A mobile polyethylene - plastic core provides mobility of the bones just as in the natural ankle. The mobility of the ankle prosthesis reduces stress on the components fixation and prevents loosening. Arthrodesis is therefore no longer a standard therapy in advanced ankle osteoarthritis. Ankle arthrodesis is increasingly the last resort if gait preserving ankle arthroplasty is no longer viable. The implantation of the ankle prosthesis is usually performed under general anaesthesia. Local anaesthesia is also an option. During the ankle surgery the patient is placed on his back. A tight tourniquet around the thigh can prevent blood loss during the ankle surgery, if for any reason the duration of the surgery is longer than usual. During a standard procedure we do not use a tourniquet; this duration is short enough that significant blood loss does not occur. Sterility and strict hygienic conditions are of the utmost importance for endoprosthetic surgery. 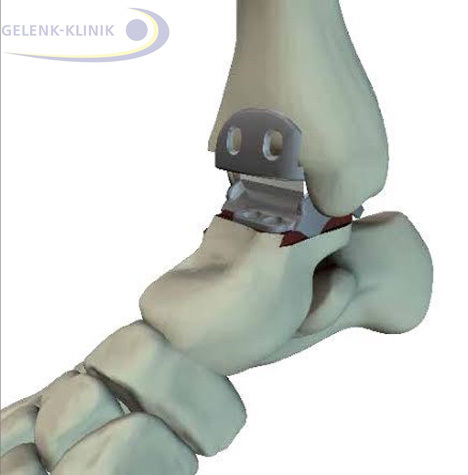 In the orthopaedic Gelenk-Klinik, the staff in the operating room are equipped with closed circuit helmet systems when performing ankle prosthesis procedures. The operating room is equipped with special air flow systems - so called laminar flow. The air current going from the ceiling into the floor of the operating room prevents infectious germs from being carried through the air. The laminar flow effectively provides the standard for a clean room. Surgeon wearing a helmet system that isolates his breath from the atmosphere in the operating room. Administration of antibiotics before applying a tourniquet. Clean room atmosphere controlled by the laminar flow air system. Gentle soft tissue treatment during the ankle surgery. Retractors are not applied during this surgery to avoid soft tissue damage. In addition, a sterile covered X-ray image intensifier (mobile X-ray unit with immediate image viewing) is available in the operating room. This image converter can control and display the situation of the ankle prosthesis in real time during surgery. The surgical skin incision is performed along the frontal area of the ankle. It starts a few centimeters above the shin bone downward to the foot. 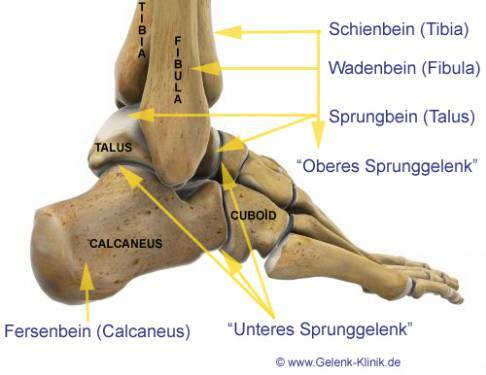 The tendons lying in the frontal aera of the ankle are not affected. The frontal part of the ankle joint capsule is visible. The skin nerves have to be displaced during the surgery to avoid neurological damage. Next, the ankle joint capsule is opened and the ankle joint is prepared for the implantation of the ankle prosthesis. In cases of severe osteoarthritis of the ankle, we have to remove the resulting osteophytes (bone spurs). With the help of targeting instruments and the x-ray image converter the resulting leg axis is double checked. The target of the bone resection is to achieve a natural soft tissue tension around the ankle with the implanted prosthesis inside. This soft tissue tension is essential for proper function of the ankle with the implant. Malalignment shortens the life span of the ankle prosthesis and reduces the chances for achieving the desired clinical outcome. For the position of the ankle prosthesis to be perfect, the exact location of the heelbone and the tension of the achilles tendon needs to be checked as well. The surface parts of the ankle prosthesis can be implanted without bone cement. The talus is covered with a metal cap. The side that covers the talus bone has a rough surface. This improves the osteointegration. It is also covered with small metal pins to provide an initial stability of the implant. The talus surface area is also covered with a metal plate. Both parts of the ankle replacements are coated on the side adjacent to the bone with a special layer in order to achieve a secure ingrowth of bone. The third component of the modern ankle prosthesis is a freely movable plastic core of polyethylene, which mediates the important mobility between the two bones forming the ankle joint. How long do I have to stay in house after ankle prosthetic surgery? The length of stay in the hospital is about 5-7 days. The early phase serves to secure the initial healing phase and the specific pain management. Lymph drainage and pain management are important aspects of inpatient therapy. The prosthesis has to grow into the bone. In order to secure this osteointegration the patients requires an optimal weight bearing during rehab - not too much and certainly not too little. Until the removal of the sutures (after 14 days) a careful mobilization in a safe ROM walker shoe is required. After 14 days full weight bearing - with general care - is possible. After 6-8 weeks an X-ray control is performed. Physiotherapy and lymph drainage treatment is an important part of the rehabilitation treatment. The surgical wound requires regular visual inspections in order to assure infection free healing after surgery. When can I drive a car after ankle replacement? In general driving is only possible when the operated leg is fully operable in every situation. This is normally the case after 8 weeks. What is the general risk of an ankle prosthesis? Long-term results of ankle replacement are the subject of ongoing scientific studies. The 8 year survival rate is reported to be around 90%. The rate for an additional operation within the first 8 years is about 6-8%. What complications are possible after the operation of an ankle arthroplasty? Infection of the ankle prosthesis. What complications can appear later on after implanting an ankle arthroplasty (artificial ankle joint)? Loss of mobility in the ankle joint. Aseptic loosening of the ankle prosthesis. General wear of the ankle prosthesis.